The countdown is on and in only a few hours I’m about to embark on my first camping trip of the summer season! While I can hardly wait to be laying by a pristine lake with sunglasses on my face and a book in my hands, there are a few things to consider first. Especially since J and I will be bringing our dog with us. If you’re a life-long lover of camping (like I am) and the “pet parent” of a camping-loving dog (also like I am), then you’re in luck. While some dogs aren’t keen on exploring the great outdoors, you’d be hard pressed to find a dog that isn’t down with sleeping under the stars. 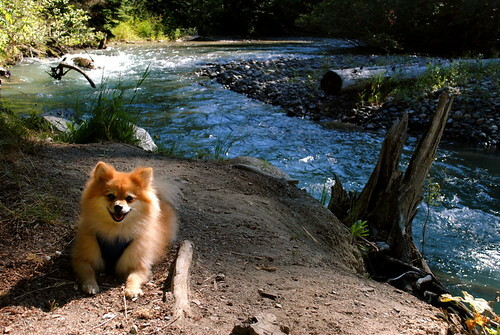 Don’t let his fluffy fur and thoughtful expression fool you: Jordy absolutely loves camping! The minute he bounds out of the truck, he’s rolling in the dirt and chasing bugs. Leashes are crucial, whether at home on the sidewalk or in a campground. Keeping your dog safe should be a top priority. Allow your fellow campers a little peace and quiet. Keeping your furry buddy on his leash will keep him within your campsite, but also ensure that he’s not barking at every little thing. Stay hydrated! Many campsites don’t have potable water on site, so when filling your water jugs at home before the trip, make sure you’re bringing enough for your pooch also. Be bear aware: depending on how far into the woods you go, encountering wildlife is not uncommon. Bears, cougars, moose, coyotes and more can be on the prowl for you and for Fido, so keep your head up and your dog close by. Shots, shots, shots: keep your dog updated on all his or her necessary vaccines. 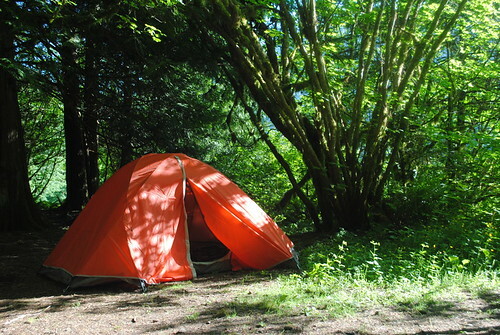 Vaccination certification will be necessary for cross-border (camping) trips. If boating is part of your camping trip, ensure that your dog is fitted with an approved PFD. Did you bring enough food? Measure out as much as you’ll need for the duration of your trip plus a little bit extra for an emergency stash. Seek shade, especially for long afternoons by the lake or the ocean. A few comforts of home can be really nice for any of us, so bring one of your dog’s favourite blankets and a toy just in case a camp-out isn’t her idea of a good time. Dogs are very much treasured members of our families, so it’s important to make them feel included. Wherever you go, ensure you leave a detailed itinerary with a family member at home. With a bit of preparation and some thoughtful planning, a camping trip can be a safe and fun time for everyone involved! If you have more tips or ideas to share, please feel free to leave them in the comments below! Jordy looks like he is having a lot of fun in that pic. Enjoy the camping trip.